Delivery time may vary according to the trucks availability or due to any other factors beyond the control of Réno-Dépôt stores. Deliveries are made between 7 AM and 10 PM. Delivery price does not include any service other than delivery (e.g. handling, installation, return of old appliances, etc.) Truck delivery is only possible within a radius of 100 km around the selected store. Additional charges may apply. 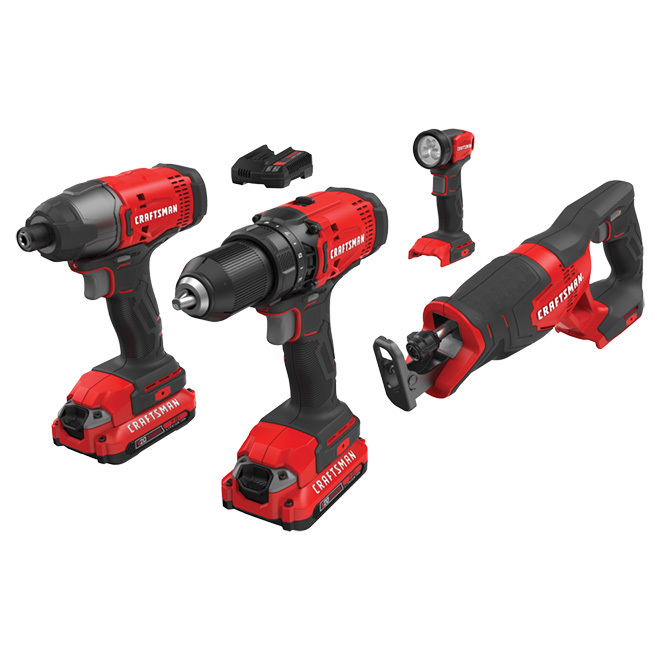 Make your renovation and construction projects easier with this convenient 4-tool set of Craftsman®'s V20 collection. The set contains the basic tool to tackle work around the house. In addition to a storage bag, a charger and 2 batteries, the cordless kit includes 1 drill/driver, 1 impact driver, 1 reciprocating saw, and 1 work light. The drill/driver, the impact driver, and the reciprocating saw all have tool-free accessory attachment. The tools are backed by a 3-year limited warranty. 4 Cordless V20 Tools Kit - 2 Batteries - 1 Charger is rated 4.7 out of 5 by 70.